Colombia’s armed forces on Saturday said that they had killed at least six presumed ELN guerrillas in combat in a troubled region in the north of the country. 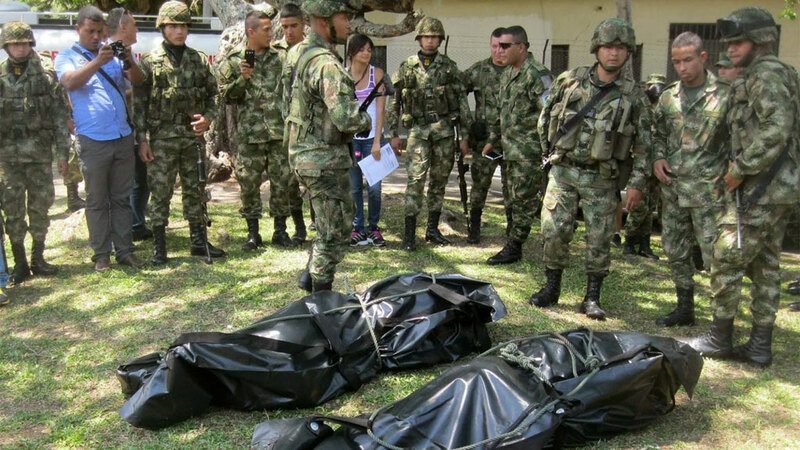 The army counterpunch came after weeks of increased ELN attacks in the Catatumbo region during which at least five members of the military were killed. Also in the combat that killed the seven rebels, the ELN allegedly began hostilities early Saturday outside of the town of San Calixto, where rebels ambushed a military patrol with gun fire and projectiles. Guerrillas from the same group were accused on Saturday of kidnapping four geologists in a neighboring town. At least two soldiers were injured in the attack that spurred the deadly counteroffensive in San Calixto. According to local media, the soldiers are combating member of the ELN’s “Diego Company,” a fighters unit that is active in the region around San Calixto. The ELN has been engaged in exploratory peace talks with the government since before June 2014. The rebel leadership recently said to be ready to formalize the talks even though both parties have said progress has been slow. President Juan Manuel Santos subsequently lowered the expectations, saying that formal peace negotiations with the ELN are not forthcoming. The Santos administration has already been talking formally with the FARC, a rebel group approximately three times the size of the ELN, since November 2012. Conflict analysts have claimed the ELN might have stepped up attacks and kidnappings as part of a strategy to gain leverage that could improve the negotiation position of the guerrillas. The group has been fighting the Colombian government since 1964.